I can remember back years ago, as a kid, noticing the Swiss Army knife on my Grandpa's key chain and thinking it was the coolest thing on Earth. Combine that with years in the Boy Scouts (Be Prepared!) and I've been carrying a pocket knife with me since Middle School. As a result, I'm always on the lookout for new knives and other tools that let my inner MacGyver shine. 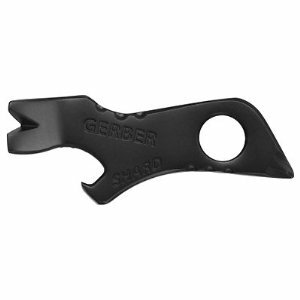 Lately I came across the Gerber Shard and thought it would be a winner. It's a bunch of handy tools you'd find on a knife: screwdrivers, bottle opener, pry-bar, wire cutter -- but without the knife itself. This is key, as it claims to be Airline Safe. I love the idea of having useful tools on me, but not having to worry that they'll cause me a headache when out and about. The days when a pocket knife was considered a tool are long gone - now they're weapons. Which is absurd, but that's besides the point. Alas, I have to say, handling it, I'm not impressed. Yes, it's compact - which is a good thing. But, it's too big to fit on my keychain (which is already bulging with other goodies - but that's another post, for another time). Another pro: the phillips-head screwdriver carved into the back of the shard actually worked well on a screw used to attach the door handle to the door. But, the pry-bar ends that are supposed to be used as screwdrivers seem to thick to actually function as one. It failed the does it tighten the screw holding the light switch faceplate test. I suppose, if you're looking for a pry-bar that's inexpensive, this is the way to go. But, as a general purpose tool, I'm just not seeing it. Obviously, I'll keep the Shard on hand and would love to be proven wrong. A tool that I've actually grown quite fond of is the oddly named Derma-Safe utility knife. 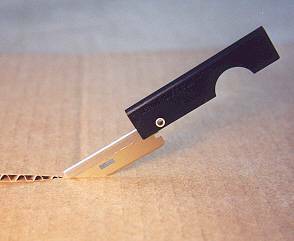 It's basically a razor blade that folds out of a simple plastic handle. I originally saw mention of it on Cool Tools, and I absolutely agree it belongs there. The knife is super light, super sharp and super cheap. Unlike the Shard, it found a place on my keychain without a problem. I love the fact that it's a nice and sharp knife I can carry anywhere, and at under $2.00 a piece, if I need to toss it out because I've got it with me at the Airline Security line or while trying to get into a museum, it's no biggie. And I never worry about dulling it or ruining the blade - it's easy enough to get a new one. The utility knife I bought months ago seems to be getting dull, so I decided I'd buy a handful more. The recommended site to buy them doesn't appear to be taking orders. Well, they took my order, but never processed it (and I got my money back - no harm, no foul). Instead, I found the best deal for the knife was on eBay. Sure, you can get them at other places like CountyComm - but who wants to pay $8.00 in shipping for a $1.70 item? These days I've been experimenting with carrying the Derma-Safe on my keychain and multitool in my wallet. The result is most of the functionality as my old Swiss Army knife, but in a package that's nearly invisible and painlessly disposable if need be (the wallet tool costs $2.23 - and has free shipping for Prime users). Unlike my usual knife, before leaving the house, I don't need to weigh whether I'll be going somewhere it might get confiscated. Still, I don't think Grandpa would be happy that I don't have a Swiss Army knife on hand, so I may have to go back to my old ways -- and just risk losing it.